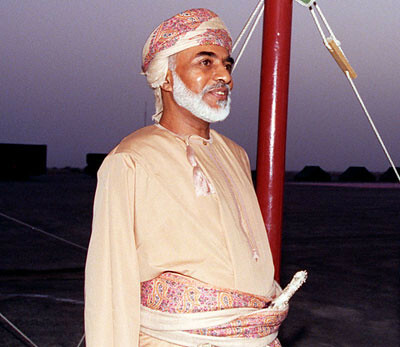 The Sultanate of Oman is ruled by Sultan Qaboos bin Said al Said, who was born on November 18, 1940. He overthrew the previous monarch, his father, Sultan Said bin Taimur, in a bloodless coup in 1970. An absolute monarch, Sultan Qaboos reportedly is divorced and has no children. Sultan in Oman by Jan Morris. The author travelled through the sultanate of Muscat and Oman in the 1950s with its sultan. The Emergence of States in a Tribal Society: Oman Under Sa'id Bin Taymur, 1932-1970 by Uzi Rabi. Reassesses the reign of Sa'id bin Taymur, who was deposed by his son, Qabus bin Sa'id, in a coup in July 1970. This study refutes the prevailing view that Sa'id's four-decade reign was medieval and isolationist. Oman Under Qaboos: From Coup to Constitution, 1970-1996 by Calvin H. Allen, Jr. and W. Lynn Rigsbee. About the current sultan of Oman, who deposed his father in 1970. Sultan in Arabia: A Private Life by John Beasant. Biography of the current sultan of Oman, Qaboos bin Said Al Said, examining "the truth about his emotional condition, the marriage that never really was, and the legacy of his time in an English household." Monsoon Revolution: Republicans, Sultans, and Empires in Oman, 1965-1976 by Abdel Razzaq Takriti. About the Dhufar Revolution (Dhofar Rebellion) in Oman, including the details of the 1970 coup that brought Sultan Qaboos to the throne. Oman's Insurgencies: The Sultanate's Struggle for Supremacy by J. E. Peterson. Looks at the crises that have tested Oman's army and accelerated its development from a traditional regime to a modern state. The Sultan's Shadow: One Family's Rule at the Crossroads of East and West by Christiane Bird. Said bin Sultan became a ruler of Oman in 1804, when he was 15 years old. An open-minded, tolerant man, he gained power through bloodshed and built a vast empire on the backs of slaves. His rebellious daughter Princess Salme, born to a concubine, scandalized her family by eloping with a German businessman and writing the first-known autobiography of an Arab woman. Memoirs of an Arabian Princess from Zanzibar by Emily Ruete. The autobiography of Salme, Princess of Zanzibar and Oman, who was born in 1840. Obscure Kingdoms: Around the World in Search of Royal Courts by Edward Fox. Published in 1993. The author travelled to Oman, Tonga, Nigeria, Swaziland, and Java. Part travel book and part commentary on kingship and its traditions.